It was confirmed last year, after much internet confusion, that Scar and Mufasa of The Lion King are indeed brothers. I am glad that's settled. 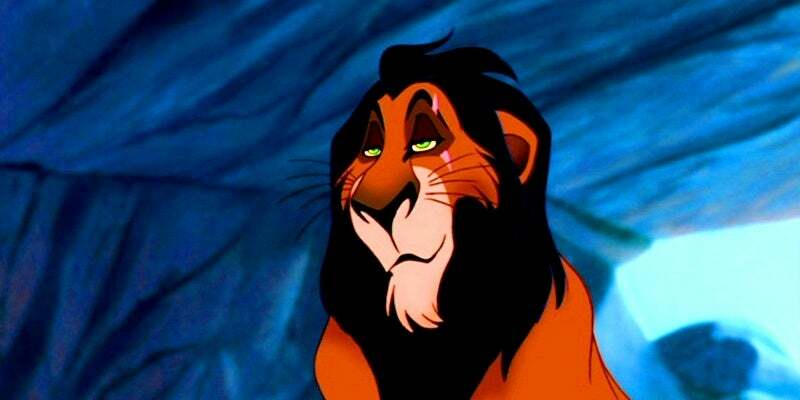 Now the only remaining head-scratcher is: Why the heck does Scar have a British accent when no other lion around has one? Was he educated at some British lion boarding school? Watch a whole lot of Brit feline flicks? Most likely, the reason is this: Filmmakers often use foreign accents and non-standard dialects to voice "bad" characters. Isabel Fattal explores this phenomenon in The Atlantic, writing the analysis piece "Why Do Cartoon Villains Speak in Foreign Accents?" Scar, Dr Heinz Doofenshmirtz in Phineas and Ferb, Jafar in Aladdin, and the evil king in Disney's Robin Hood are a handful of examples of the "bad guys" she's talking about. It's one of those things that I've always kind of noticed, but never paid a great deal of attention to. Fattal argues that parents should. Whether or not we know it, with every movie-making decision, cultural biases can slip in. And kids pick up on them. Sociolinguist Calvin Gidney, who studied language patterns in animated kids' entertainment with Tufts professor Julie Dobrow, explained to The Atlantic that while the foreign accents in films differ, the common denominator is the binary distinction of "like us" versus "not like us". Gidney told Fattal that in The Lion King, "I thought it was really disturbing that it was necessary to 'take back the jungle' from the British-sounding evil lion, plus the African American-sounding and Latino-sounding hyenas." From Scar to Aladdin's Jafar, the study found that British is the foreign accent most commonly used for villains. German and Slavic accents are also common for villain voices. Henchmen or assistants to villains often spoke in dialects associated with low socioeconomic status, including working-class Eastern European dialects or regional American dialects such as "Italian-American gangster" (like when Claude in Captain Planet says 'tuh-raining' instead of 'training.') None of the villains in the sample studied seemed to speak Standard American English; when they did speak with an American accent, it was always in regional dialects associated with low socioeconomic status. Fattal explains that since "television is a prominent source of cultural messaging for children" (that is, many watch an absurd amount of it), the correlation of foreign accents with villains "could have concerning implications for the way kids are being taught to engage with diversity in the United States". Gidney and Dobrow are doing further studies to examine exactly how. Given that Western children consume so much American media that Standard American English is rendered the norm, it stands to reason that giving villains differing accents could also have a concerning impact on children even outside America. That's the case for english and US comics only. In french comics, the bad guys have the same voice as the heroes. Also, why did they not find it disturbing that Simba had to take back the jungle with the help of an Italian American warthog? Seriously? Simba teams up with an overweight mafioso and that’s okay. But it’s not okay that a group of marginalised hyenas would be resentful of their supremacist, lion masters. I mean geez! The film literally starts with an description of the food chain and the explanation that the lions are the ruling class due to their superior genetics.